Dmitry Medvedev's plan, announced last week in his address to the Federal Assembly, of creating a special “boss” for the North Caucasus, seems an absolutely logical step. During the past few months Medvedev has repeatedly criticized the present state of affairs in the region, pointing to the absence of any serious progress there. So harsh were his remarks on the situation that many experts decided they were really an attempt to undermine the authority of Vladimir Putin – author of the federal centre’s current law enforcement policy in the North Caucasus. These assumptions were not confirmed, as the president confined himself to criticism, without offering any new approaches that could replace the old failed policies of the Kremlin. Obviously, the spring and summer of this year have been unprecedented in terms of the damage inflicted on the North Caucasus armed underground by the Russian authorities. The attempted assassination of Ingushetia’s President Yevkurov, the murder of a number of senior Chechen and Dagestani interior ministry officials, the bomb attack on the Nazran police headquarters – these are just a few of the operations which demonstrate that the position of the underground has not been disrupted, but is on the contrary year by year becoming more robust, in spite of the constant improvement of repressive technologies by the local and federal law enforcement agencies. The decision by the Caucasus Emirate leadership to return to the tactic of the "human bomb" has radically expanded the arsenal of ideological and military weapons at the mujahideen’s disposal. While the suicide bombings, with their simplicity and low financial cost, are able to circumvent the problem of depleted resources, they are also extremely difficult to combat, because the preparation of such actions involves a minimal number of people, and the information does not go beyond the circle of initiates. And although "human bombs" are not particularly effective as a fighting weapon, their ideological role is much more significant. They are living proof of the strength of an ideology which motivates people to sacrifice their lives in the name of its victory. It is safe to say that not at any time since the beginning of the second Chechen war has the underground movement made such impressive strides in two areas: internal reform and the planning of the seasonal campaign. Therefore, Dmitry Medvedev’s statements casting doubt on the success of the federal strategy in the North Caucasus could indicate the start of a large-scale review of Putin’s entire North Caucasus policy. And the appointment of a special presidential “czar” for the region would be the natural conclusion of an anti-Putin coup in this organizational field. However, it looks as though these high-profile announcements will remain at best empty declarations devoid of real content. By itself, of course, a new government post will not solve any problems. In the absence of a new regional political doctrine, any bureaucratic reorganization of this kind is doomed to failure. 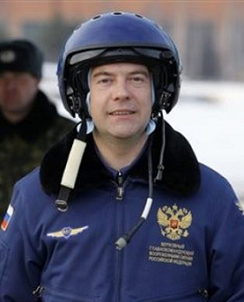 The fact that Medvedev has not the slightest idea what to do was obvious from his presidential address. Having announced his fateful decision to create the post of Head of the Caucasus, he stopped there, without explaining the reasons that had compelled him to take such an unprecedented step. Now the political analysts are trying to guess who the new appointee might be, going through the names in their minds. Over the years there has been no shortage of public officials sent to the North Caucasus on special assignment. Responsibility for North Caucasus affairs has been entrusted to a variety of individuals – they have included crooks, statesmen of solid reputation, and inscrutable envoys who left behind not even a memory of themselves. Remember Kazantsev, Kozak, Rapota. For all the dissimilarities in personal approach and ability, what each of them achieved boiled down to the same thing: a total zero, together with a complete absence of any desire to acknowledge it. Meanwhile, as Medvedev's experiments give off an air of declarative emptiness, his potential antagonist has consistently stuck to his guns without raising doubt as to the identity of the main source of serious projects that lack much relevance to the North Caucasus. The opening last week of an international terminal at Grozny airport and the scandal of Ramzan Kadyrov’s promotion to the rank of major general show that Vladimir Putin does not intend to give up his priorities, even if his successor is showing cold feet.